(TibetanReview.net, Jan07’19) – The Vatican has ordered two bishops previously appointed by it to step aside in favour of Beijing-appointed priests who it had previously excommunicated. The underground bishops Vincent Guo Xijin of Mindong (Ningde) and Peter Zhuang Jianjian of Shantou have given way to the government approved Chinese Patriotic Catholic Association (CPCA) bishops Vincent Zhan Silu and Joseph Huang Bingzhang, reported the Catholic News Agency Jan 6. 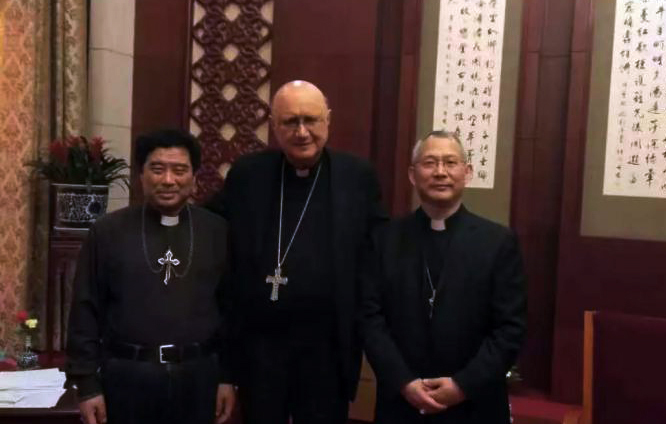 Both Zhan and Huang had previously been excommunicated by the Vatican. But now they have been reconciled to the Vatican as part of a Sep 22, 2018 agreement between the Holy See and the People’s Republic of China. Guo was stated to have agreed to become an auxiliary bishops while Huang has apparently retired. Bishop Guo, 59, was detained by the Chinese authorities overnight in Mar 2018. He was released after only a short detention but ordered not to officiate as a bishop while presiding over Mass because he was not recognized by the government. Bishop Zhuang, 88, was asked to retire in late 2017 by the Holy See, but he reportedly refused the request at that time. In Dec 2017 he was escorted to Beijing, where he met separately with leaders of the Chinese Catholic Patriotic Association, officials from China’s State Administration for Religious Affairs and the Vatican delegation. However, some have expressed worry that the agreement transforms the Church into a “party instrument”. Pope Francis had acknowledged Sep 25 that his landmark deal with China over bishop nominations will cause suffering among the underground faithful and took full responsibility for it. However he explained that it was he — and not Beijing — who will have the ultimate say over naming new bishops. But the present development does not seem to reflect this to be the case. The Vatican’s main objective for signing the deal was stated to be to defend and improve its market share in a country with promising growth potential. It was reported to have agreed to recognize seven bishops appointed by the Chinese government.